Companies are relying more and more on multiple cloud (multi cloud) providers. However, setting up the connectivity between those providers is difficult. And, maintaining and monitoring the tunnels is time-consuming and cumbersome to troubleshoot. Aviatrix simplifies this by providing simple, point-and-click tunnel creation between cloud providers. 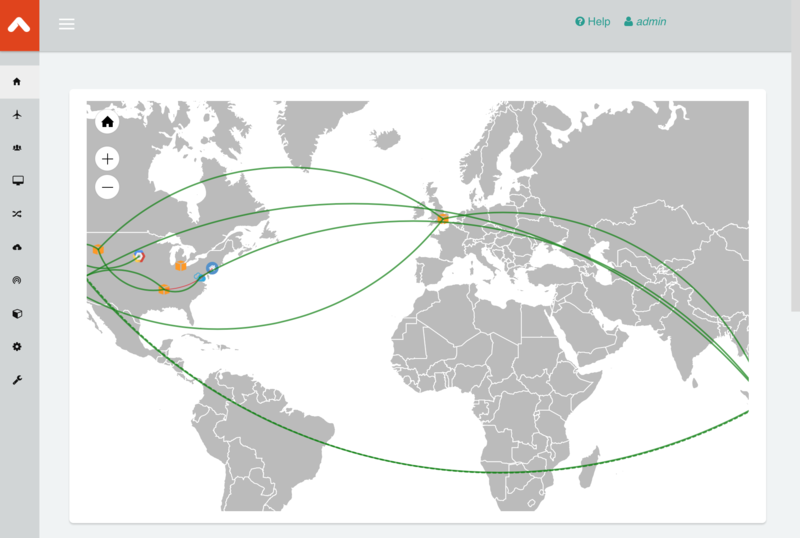 Additionally, Aviatrix gives you a single, centralized location from which to troubleshoot and monitor your connections. The Aviatrix Controller automates, monitors, and reacts to events in each cloud environment on your behalf. In order to do this, we’ll need to configure a few things in each cloud to support this. We’ll walk through these steps in the following sections. Once complete, you can connect to one or both cloud providers. Start by logging into the Azure Portal. 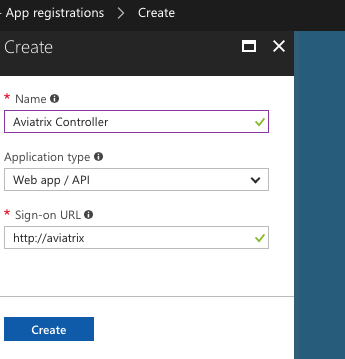 The first step is to install the Aviatrix Controller from the Azure Marketplace. 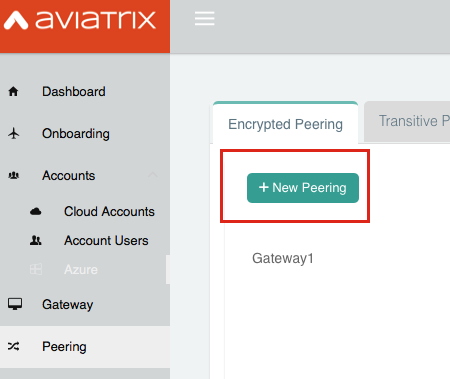 Select the Aviatrix Cloud Gateway to AWS and GCP from the Marketplace. Configure the new VM to meet your preferences and requirements. Be sure to allow inbound connections on port 443. Once ready, launch the new VM and continue to the next step. Copy and save the Directory ID for later use. It will be referred to again as the Application Endpoint . Close the Keys window using the X in the upper right corner. Close the Required Permissions panel by clicking on the X in the upper right corner. Your Aviatrix Controller should be up and running by now. Go back to the Microsoft Azure portal and find the newly created instance. Open it and copy the Public IP address . Open a browser and navigate to https://<public ip address>/ . You may receive a warning about the certificate not matching. You can safely ignore this and continue to the page. When you arrive at the login prompt, login with the Username admin . The password is the private IP address of the Azure instance. The Private IP address can be found on the instance page by clicking on the Networking navigation link. After logging in, you will be prompted to provide your email address. This is used for alert notifications as well as for password recovery. Enter your email address and click OK .
Set the admin password to something you will remember and click Save . If you require a proxy for this instance to get to the internet, enter that now. Otherwise, click Skip . Finally, the software will be upgraded. Click the Run button and the latest version of the Controller will be downloaded and installed. This will take a few minutes. Once complete, the login prompt will appear. Login with the username admin and the new password. 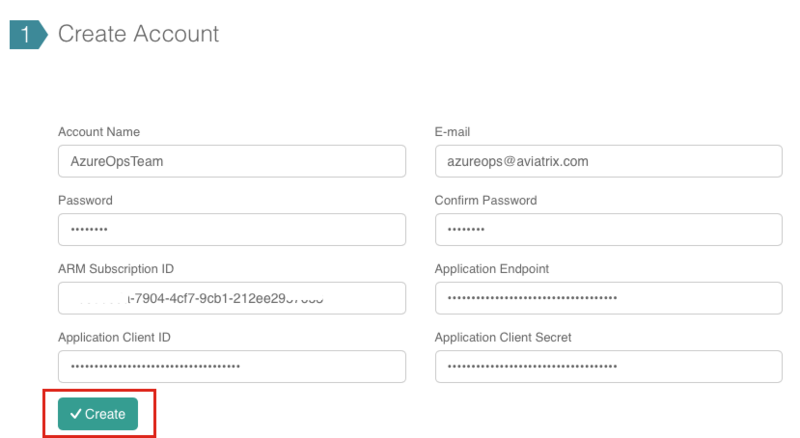 After logging in, click on the Azure ARM button to connect Aviatrix to your Azure account. Account Name The login/username for users who will have admin access to Azure resources. For example, AzureOpsTeam . E-mail The e-mail address for this team. ARM Subscription ID The Subscription ID you saved in a previous step. Application Endpoint The Application Endpoint (i.e., the Directory ID ) retrieved earlier. Application Client ID The Client ID (i.e., the Application ID ) saved earlier. Application Client Secret The Client Secret (i.e., the key value) displayed earlier. Once complete, click the Create button at the bottom of the form. 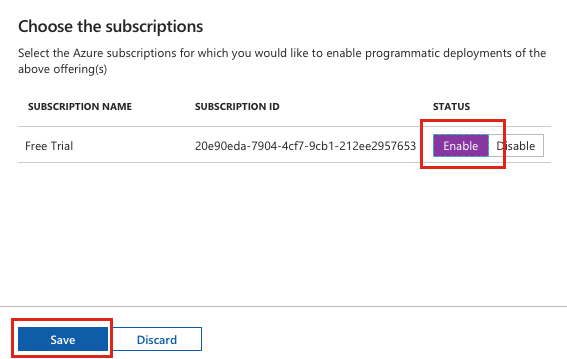 Before you can automate launching an Aviatrix Gateway, you must first subscribe to the Aviatrix Companion Gateway in the Azure Marketplace. Click on the Enable status button. The controller can now automate creating a Gateway within Azure. Switch back to the browser tab or window with the Aviatrix Controller. Next, click on the + New Gateway button. 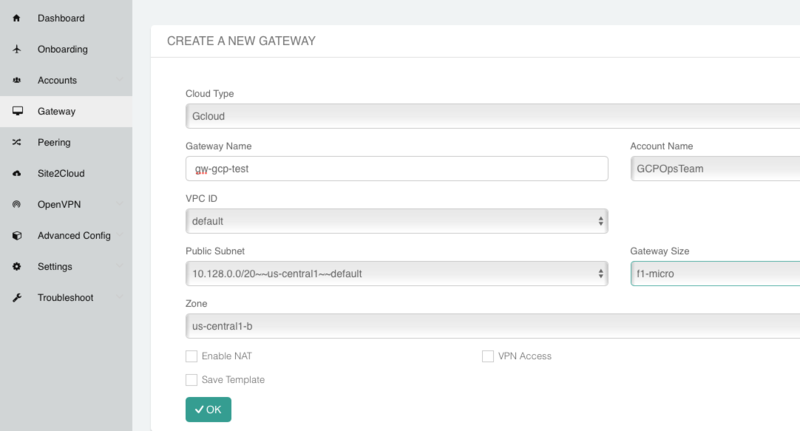 Populate the Gateway Name and select the appropriate Region , VNet , and Public Subnet . The Gateway Size can be left at the smallest size. It can be scaled up (and out) later if needed. Click OK to create the Gateway automatically. This will take a few minutes as it creates the instance in the selected region and sets up the appropriate route table entries, etc. Once complete, click X Close . 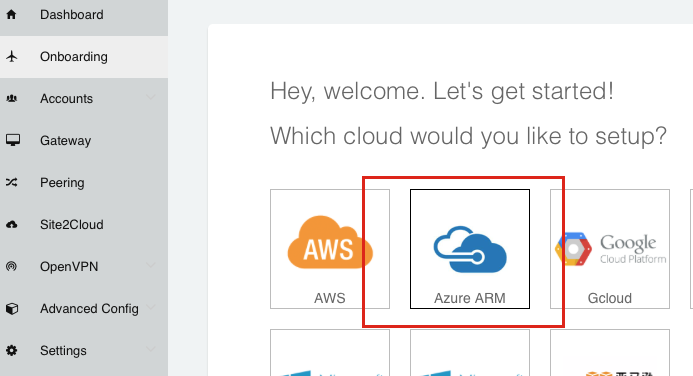 Now you have a Gateway in Azure that can connect to either (or both) AWS or GCP. Go to the Onboarding section on your Controller. Account Name The login/username for users who will have admin access to AWS resources. For example, AWSOpsTeam . IAM role-based Leave this unchecked for now. For production use, you’ll want to use IAM roles with specific permissions. 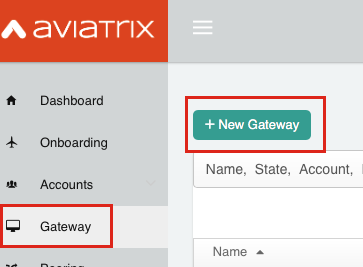 Head back over to the Gateways section in the Aviatrix Controller and click on + New Gateway button. Select the appropriate values for Region , VPC ID , and Public Subnet . Keep the default Gateway Size at t2.micro . Check Allocate New EIP so a new Elastic IP will be allocated on creation. 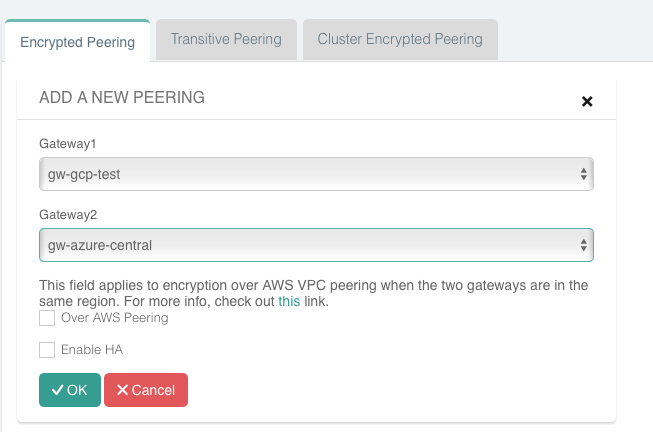 Create a new VPC for testing. Click on the Peering navigation link on the Controller. That’s it. Your Azure VNet instances can now talk to your AWS instances over a secure tunnel. You will soon receive an email notification that the tunnel is up. You’ll receive additional notifications if the tunnel goes down. 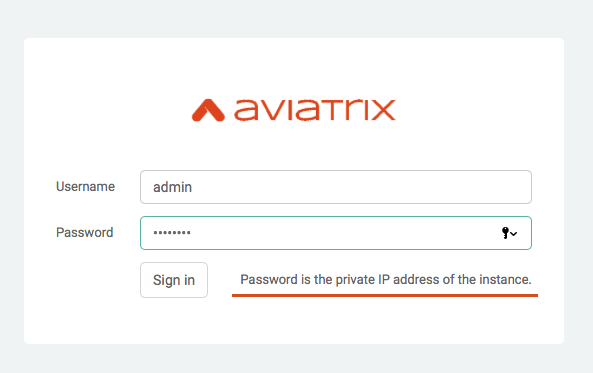 The Aviatrix Controller requires a few settings to be enabled in order for it to be able to interact with your Google Cloud account. 1. Find the Project ID From the Google Cloud Console Dashboard, copy and save the Project ID . 2. Enable GCloud Messaging Service The Controller relies on Google Cloud Pub/Sub APIs to communicate with the Gateways in GCP. Enable these APIs by going to the APIs & services Dashboard for the selected project. Click the Enable APIs and Services link at the top of the page. Select Google Cloud Pub/Sub API from the list. Then, click Enable . 3. Create Credentials File Navigate back to the APIs & services Dashboard and select Credentials (or click here). Click Create credentials drop down and select Service account key . Select the Compute Engine default service account for the Service account and select JSON for Key type . Then, click Create . A file will be downloaded to your computer. Find it and store it in a safe location. Then, click Close . 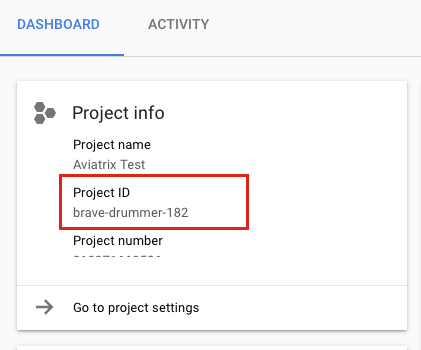 You are now ready to connect the Aviatrix Controller to your Google Cloud Platform account. 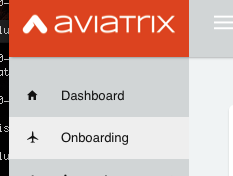 Go to the Onboarding section on the Aviatrix Controller UI. 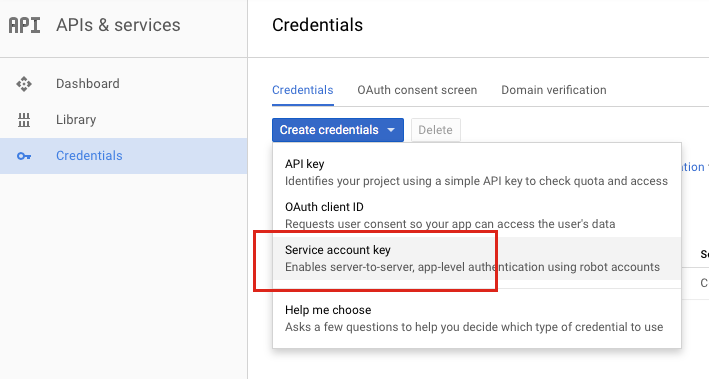 Account Name The login/username for users who will have admin access to Google Cloud resources. For example, GCPOpsTeam . GCloud Project Credentials Select the credentials file created in an earlier step. Select the Cloud Type to be GCloud . Enter a Gateway name . Select a VPC ID , and Public Subnet . Keep the default Gateway Size of f1-micro . That’s it. Your Azure VNet instances can now talk to your GCP instances over a secure tunnel. You will soon receive an email notification that the tunnel is up. You’ll receive additional notifications if the tunnel goes down. 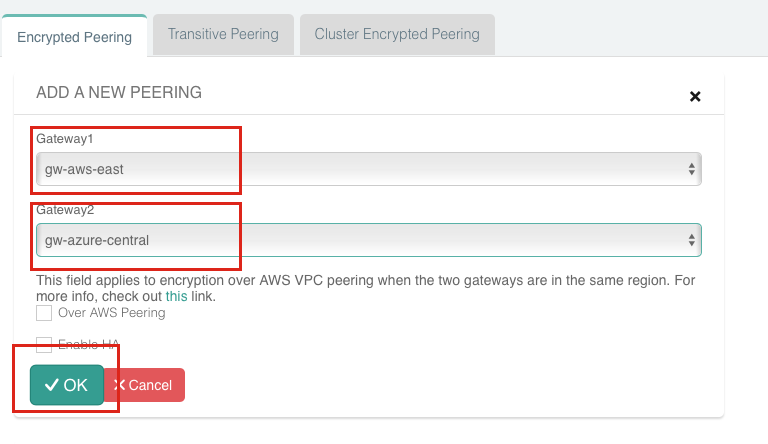 Now that you have the accounts established, you can easily add connectivity to other VPCs in either AWS or GCP. 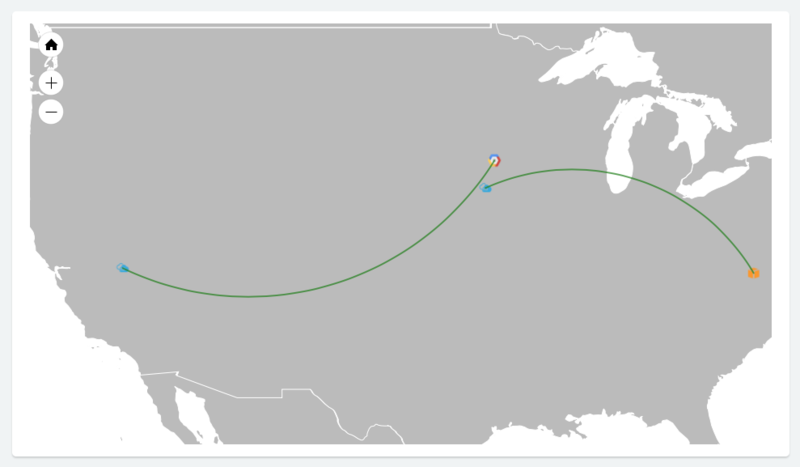 And, of course, you can also connect AWS to GCP.